One of the more difficult things with autosomal DNA testing is determining relationships with those you match. If you are an autosomal customer with 23andMe, FTDNA, and/or Ancestry, finding the relationship between you and your "declared cousin" often is an impossible task. Sometimes, however, you can get hints on a relationship based on location, listed surnames, or by triangulating the data with other known relatives. 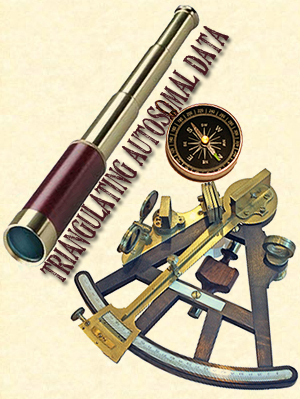 Originally, the term triangulation was the estimation of distance or height by using the measurement of triangles – hence, the name "triangulation." 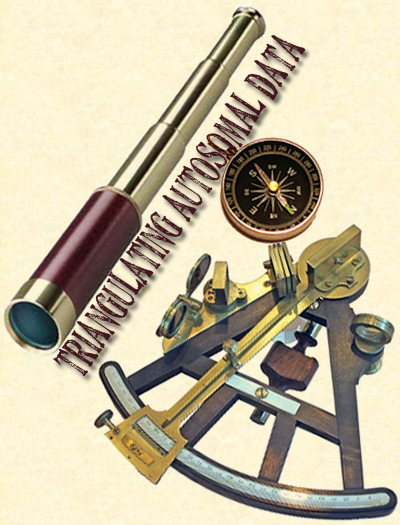 In marine navigation, sextants were used to help triangulate positions of celestial bodies in reference to the horizon. Triangulation in DNA analysis allows for an unknown to be measured along with constants to determine a possible relationship with another person. In this post, I was able to narrow down the possibilities of the relationship between me and a person that shares a particularly high percentage of DNA. A few weeks ago, I was contacted by a lady named Jan who recently shared genomes with me and my brother. Her match at 0.41% was the fifth highest match of those who were not my known family members. With my brother, her 0.44% match was his sixth highest match for non-family members. When Jan contacted me about how we might be related, I went by a methodical process of elimination that helped in the triangulation process. Since I have only one living parent, I checked if Jan matched my mother. She did not; therefore, such a high match was relegated to my father’s side. In many cases, this is as far as it goes as there are no indications where on a particular side the connection occurs. Since I’ve been particularly interested in my patrilineal line, I have had several relatives that have tested at the third cousin level and further distant. Not counting two individuals that have non paternity events within their lineage, I have five fourth cousins and a fourth cousin, once removed in this lineage. Since these folks are fairly distant, I am rarely able to triangulate relationships using these relatives. A second cousin, twice removed who is a also third cousin, once removed: Craig. Since, I know that Jan’s connection is on my paternal side, I began looking to see if she shared with any of the above. Of the six individuals, Jan shared with only one – Suzanne. Although it was fortunate that the share was at the same location on Chromosome 19, there was one problem. I share 100% of Suzanne’s paternal ancestry and she shares 75% of my paternal ancestry. The only paternal line we do not share was my surname lineage and its related lines. For the Day/Champlin lines, our grandmothers were sisters. For the Merriman line, Suzanne's grandfather and my great-grandmother were siblings. Unless other data were available, it looked like the match could be from most of my paternal lineage. 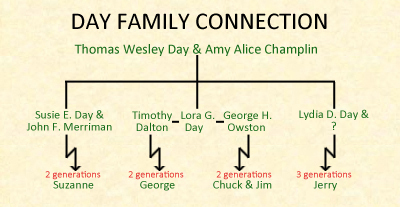 I needed some way to eliminate either the Day/Champlin lineages of my grandmother or the Merriman line of my grandfather, his mother, and her forebears. I began looking at others in our family to see if anything could be gleaned from Chromosome 19. With luck, we found a matching segment to a third party that was shared between my half-cousin George and my second cousin, once removed Jerry. Since they match on this segment, it had to be transmitted to George and Jerry via their common ancestors – the Day/Champlin lineages. Interestingly enough, my great-grandmother has numerous family members buried in the “Gardner-Bulkeley Cemetery” in Bozrah, CT. While my great grandmother had three Gardner lines, we are uncertain how the Gardner families and the Bulkeley family were connected – but it appears that there may have been some other connection beyond sharing the cemetery name. With the elimination of my grandmother’s lineage in the connection to Jan, we turn to Jan's shared segments with Suzanne, Chuck, and me – the Merriman family. While I know very little about some of the names contributing to this lineage, the names I do know are Merriman and Jones (my second great-grandmother’s maiden name). While Merriman is an English surname, it does not appear to be the ancestry of my Merriman ancestors, as many secondary sources list the family as German in origin. According to these accounts, the family came from Germany and settled in Maryland prior to obtaining property in Allegheny County, PA around 1800. While the Merrimans are a large family, it is unfortunate that many of the maiden names of the women in this lineage are unknown. Another person matching Jan and my family members on Chromosome 19 listed that her paternal great-grand parents were born in Germany and maternal lineage was Scandinavian. This would seem to indicate that our connection would be German in origin, as I have no recent Scandinavian ancestry. Others matching my brother and/or me at the same location also have some German ancestry. We know these matches are paternal, as my mother does not match any of these individuals. Since my second great-grandmother was Welsh, this would appear to eliminate her lineage and concentrate on the Merrimans and their allied families. Unfortunately, the records of the Merriman family prior to 1800 are scant. We know that some of this family fought with Mad Anthony Wayne in the Indian Campaigns following the Revolution and they settled in Ohio Township, Allegheny County, Pennsylvania; however, beyond that, the details of this large family are largely unknown. There are also conflicting views on the number of Merriman patriarchs. Some genealogists believe that there was only one while others point to three brothers that sired this large family from western Allegheny County. While I was originally a proponent of the three brothers theory, other data have swayed me to consider a single patriarch view. Although not covered in the above, triangulation allowed us to determine that the paternal segments on Chromosome 19 for our brother John is from the Day lineage. 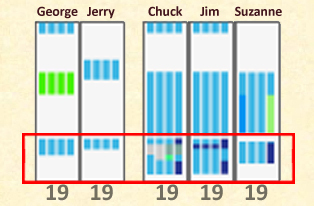 Since John does not match Suzanne, me, or Chuck (Merriman) or George and Jerry (Champlin) on this segment, he would have inherited his paternal segment from my grandmother’s father. This may be helpful in determining future matches that he has at this location. Was it an exercise in futility? No, not really, as it showed how testing varied family members can help in formulating a hypothesis of relationship. It also showed how difficult it is track relationships when little is known about a particular family. The moral of this exercise is that triangulation is easier when you have a larger pool of close relatives for which to compare results.